Friday Barnes and her roommate, Melanie Petty, were sitting in the dining hall at Highcrest Academy, enjoying second helpings of chocolate cake. "I think it's Tuesday," said the boy, confused. "No, my name is Friday," explained Friday. Getting arrested was the last thing Friday expected after solving the swamp-yeti mystery at her boarding school. But she better clear her name fast! She’s got new cases to investigate, like a scandalous quiche bake-off, a decades old mystery buried in her school’s backyard, and why the new boy, Christopher, is being so nice to her. 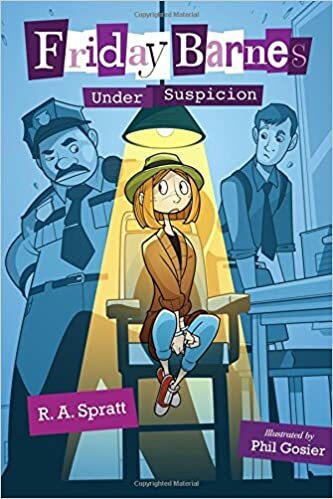 More adventures and intrigue ensue in Friday Barnes, Under Suspicion, the second book in the illustrated Friday Barnes mystery series, starring a genius detective with the brains (and social skills) of Sherlock Holmes. This looks and sounds fun! This looks super cute. It looks perfect for my niece. Thank you so much for sharing! Sounds like a fun story -- for kids and for adults. I'm going to have check into this one. It might be a great addition to our local library. LOL Sounds cute! Happy weekend! This looks like a fun book; and what a perfect title for Friday 56 link.